Robust design to work under severe conditions of working. Grab action is done by hydraulic cylinders due to which mechanical work on trolley drum is reduced saving lot of wear & tear to wire ropes as well as drum which happens due to, " To & Fro" motion of ropes to operate mechanical grab. 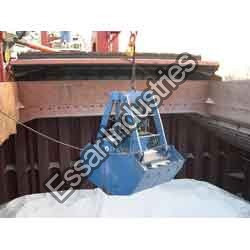 Hydraulic GrabHydraulic Grab is a system designed to replace manual Unloading / Loading high density material, mounted under a hook or via rope system, buckets to lift bulk material in a huge volume both wet / dry type. 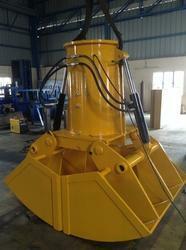 Hydraulic Grab is 5 Jaw Series, Orange Peal Type, Individual Hydraulic Cylinder for each Jaw.